So after careful consideration and realizing that I do have good, generally well-behaved children. I am not struggling with any major issues with my kids, just normal everyday stuff. Still, I must confess that sometimes I can not handle all of their requests, and saying “no” works. Simply saying no or barking orders about what kids should be doing can be expedient in the moment. However, it does not foster their sense of capability or independence and can make the situation ripe for power struggles. If I want to achieve the goal of being more positive, I would have to give more power and responsibility over to my kids. Positive discipline does not mean that kids always get their way or that you say yes to everything. It means giving kids opportunities to have some age appropriate control over their own world, within the firm and loving boundaries you feel comfortable with. Sounds like a good plan, right? In our upcoming posts, we will give you 3 strategies to use when you struggle with no the most. Leave us your comments. Your feedback is greatly appreciated. Let us know what other topics you would like to have discussed. Share this post with your family and friends. Remember to always praise your child. Yes, you can get your kindergartener out the door on time. Let the mad dash to school begin! 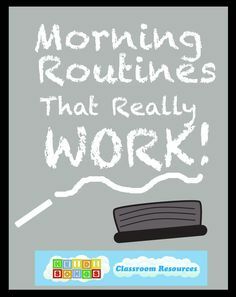 For most parents, mornings are especially difficult because you and your child have very different agendas. You need to get yourself to work and your child to school on time and you are focused on getting everyone out the door without being late. Your child, however, is probably hoping to play with the cat or catch some more Zz’s. When he should be putting on his shoes, he might instead be found organizing his rock collection or dancing barefoot around his room. Dawdling and living in the moment are standard operating procedure for 5 and 6-year-olds. Children at this age have no real sense of time or urgency. Because they have not yet developed organizational skills and can have a hard time with transitions, multitasking is not easy. Kindergarteners are also still learning to delay gratification, which makes it hard for them to choose what they should be doing and not what they want to be doing. Overseeing the family’s morning routine can be stressful. Since your child will feed off your energy, try to stay as calm and relaxed as possible. Make sure the directions you give are concise and firm. In difficult moments, remember that your child is not intentionally trying to make you late; sometimes kids just run on their own schedules. Leave us your comments. Your feedback is greatly appreciated. Let us know what other topics you would like to have discussed. Praise your child often and offer encouragement. Share this post with your family and friends.